Our go-to facial oil to lock and seal in moisture for long lasting hydration. Formulated with a blend of oils to soothe, deeply moisturize and reduce acne blemishes. The ideal choice for those with dry, combination or acne prone skin. Lavender essential oil is anti-inflammatory, reducing fine lines and wrinkles. Or, ya know because you’re clearly young with fabulous skin, to help prevent future signs of aging. The oils are kept in a tinted amber bottle to protect them from sunlight deterioration. You won’t be disappointed adding this beauty to your daily skin care routine. Enjoy! Ingredients: Argan Oil, Jojoba Oil, Vitamin E Oil, Lavender Essential Oil and Tea Tree Essential Oil. TO USE: A little goes a long way with our facial oils. 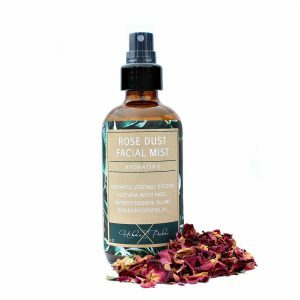 Apply a few drops to your face after cleansing and moisturizing as the final step in your skin care routine before applying any make up. Massage oil into skin until absorbed *Facial rollers can be used for this step for deeper hydration into the skin.